Tired looking eyes can often be one of the first signs of aging. The skin around the eyes is more delicate than the skin on your face, and subsequently, it becomes thinner and more crepey as it loses collagen and elastin. This can be treated with Erbium Fractional Laser, InfraRed (IR) Skin Tightening Laser, or aggressive microneedling which help to build new collagen in the skin, making it appear thicker and more youthful. Fat loss around the lower eyes also occurs with age and genetics, resulting in hollows known as tear troughs. 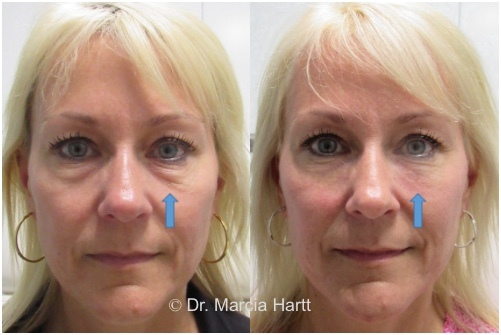 Tear troughs do not only age a person, but can also make people look chronically tired, even when they are well rested. Given the genetic component, some people develop tear troughs as early as their twenties. Dermal fillers injected into these hollows can replace the volume that time or genetics have taken away. Don’t worry – you’ll still look like yourself, just a younger more confident self. 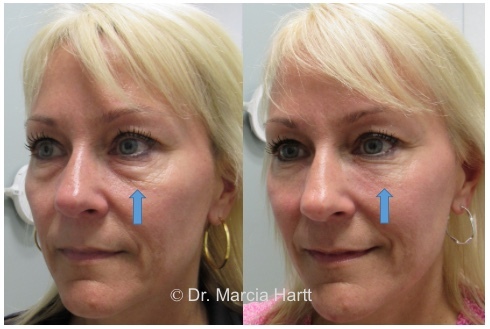 Our Before and After Gallery shows the natural results of Dr. Marcia Hartt’s clients! Crows feet at the corner of the eyes are wrinkles caused from years of smiling or squinting. These wrinkles can be greatly reduced with Erbium Fractional Laser treatments, microneedling or injectable neuromodulators. Call today for your free skin analysis.